Who’s voted off from The Voice Season 14 tonight? The results are in and the eliminated singer from the Top 10 will be revealed tonight, Tuesday, May 8, 2018. 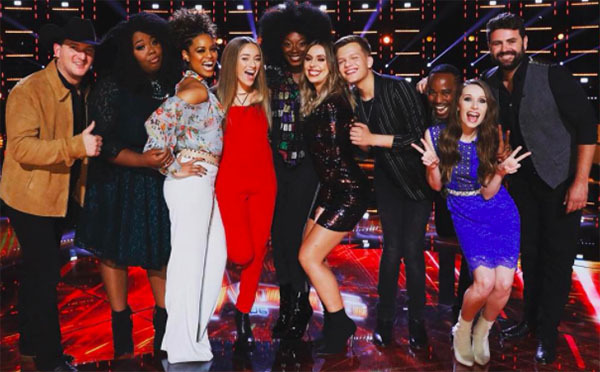 The Voice results tonight, the Top 10 becomes Top 8 — two artist will be sent home and the rest will move on to the next round of the competition. The Top 10 facing the elimination tonight are Brynn Cartelli and Kaleb Lee from Team Kelly; Rayshun LaMarr and Jackie Verna from Team Adam. Kyla Jade, Pryor Baird and Spensha Baker from Team Blake; Britton Buchanan, Jackie Foster and Christiana Danielle from Team Alicia. Also tonight, The Voice will feature musical performances from Charlie Puth and 5 Seconds of Summer. Last week, Sharane Callister from Team Adam was eliminated from the show. Who do you think will be eliminated and who will move on? Write your prediction on the discussion box below. The Voice airs tonight on NBC at 8/7c with Adam Levine, Blake Shelton, Alicia Keys and Kelly Clarkson as judges and Carson Daly as host. Keep locked on this page, The Voice 2018 Top 10 live results, recap and videos will be posted on this page once available online. What do you think of the results? Share your views on the discussion box below.